[Q] are there Official Apple Stores in South Korea ? [Q] still non-comprendo : WHY is there NO Official Apple Store in such a crowded country where advanced consumer technology can be witnessed every day ? [Q] What ?! how do you pronounce a# ? and ain’t Frisbee a plastic UFO dish you throw to your doggie on the beach ? and my CONCIERGE is the solemn butler at Ritz-Carlton Suite right ? then willys is the good ol’ jeep of WWII fame – Oh, they still used it during the Korean War is that why ? then is Alife related to a#shop ? I mean, what is this with the incomprehensible names of these Apple Premium ReSellers in South Korea ??? [Q] so what is the difference between these Apple Premium ReSellers ? WHERE would you fathom its geographical location to be ? [Q] is it better to buy an iPod/iPhone/iPad/Mac abroad and bring it in ? [Q] is eBay international shipping pretty safe in South Korea ? [Q] do expatriates in South Korea use Apple products much ? [Q] and should I sell my device when leaving the country for good ? [Q] are Apple accessories sold in South Korea just about the same as the States ? [Q] can I get my Apple product bought in the States repaired in an Apple Support Center in South Korea ? [Q] what is Apple product support like in South Korea ? [Q] even while abroad I enjoyed Korean mp3 players AND earphones immensely popular for a while . how do they stand now against iPod Touch 4th Generation ? [Q] do Korean people generally prefer iPhone or Android ? 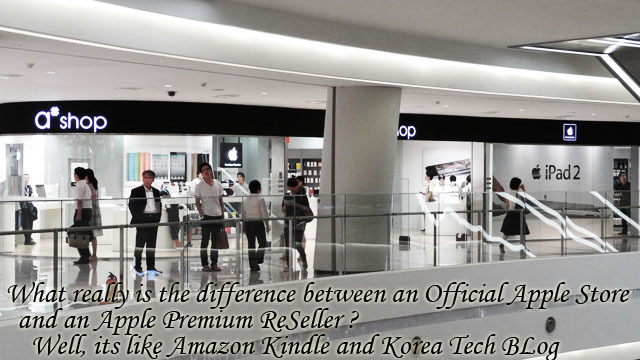 [Q] Which is better to use in South Korea : Apple iPad or SamSung Galaxy Tab ? [Q] what is the user ratio between PC and Mac computers in South Korea ? ☞ as of 2012 Mac users amount to less than 1% to maximum 3% depending on the source AND how you measure demographics . [Q] would a PC or Mac be more safe to use internet banking in South Korea ? ☞ by necessity of ActiveX, even Mac users have to switch to Windows when using On-Line banking . ☞ either Apple-contracted telecommunication companies or reputable media source . [Q] how come you don’t have extensive previews and reviews of Korea’s very own SamSung Electronics’ Galaxy cell and smart phones and tabs ? matter of fact : you barely mention them aside from electric or electronic appliances ..
☞ it comes two-folds in product as well as marketing : because they try to saturate the market with needless number of models, THEN casually practice unethical sales such as dumping and rank-site tweaking . 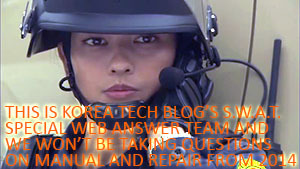 [Q] oh, BTW by-the-way : is there any good, dependable no-BS AND regularly updated Tech BLog dealing with Korea and Korean electronic products ? BUT much have shifted since the post date a year ago for Apple is changing the demographics of mobile life in Korea . I will try to update the links but do mention what product you need care for because only a few of those do computers . and if you know which area she is at .